Pardon the slight paraphrasing of Mark Twain’s and British Prime Minister Benjamin Disraeli’s quote! As we are in the era of fact-checking and fake news, I thought some fact-checking on marketing “truths” would be in order. Brands vary in penetration but…[there are] very few loyal brands. Verdict: 3 (out of 5) Pinnocchios (mostly false). It seems the whole marketing world uses NPS and it does have value, but it is far from the only statistic you will ever need. I’ve seen NPS used as a substitute for brand equity measurement but the NPS question (how likely would you be to recommend…) only makes sense to be asked of current users, yet for many businesses, much business in one year comes from prior year NON-BUYERS. In particular, non-buyers who are favorable to your brand are your source for growth. NPS gives you no insight into that group. Brands vary in penetration but not so much in purchase frequency. In general, there are very few loyal brands. This claim comes from The Ehrenberg-Bass Institute as reinforced at the recent ARF media conference. While it is true that brand share and brand penetration are highly correlated, it is not true that brands have similar loyalty levels. In fact, loyalty (properly defined) is MORE correlated with market share than penetration. This claim suffers from defining loyalty in the worst ways possible…percent who only buy that brand and average purchases per buyer in a given time period. The BEST construct for loyalty is “real loyals”. I created this metric in the 90s while at the NPD Group, as I was developing the math for BrandBuilder, a leading brand equity model. A real loyal was a respondent whose attitudes were highly favorable to a brand they bought more than 50% of the time (only about 70% of heavy buyers meet the “favorability” acid test). The correlation between the size of the real loyal group and market share is linear and over 90% based on nearly 100 brands we measured irrespective of product or service category! Worst of all, believing that penetration is all that matters leads to disastrous marketing approaches like avoiding programmatic targeting, killing your loyalty programs, and abandoning any thought of journey-based personalization. MTA is based on statistical analysis of the stream of marketing exposures relative to conversions from user level data. It is often based on millions of user records. Last touch attribution gives all the credit to the conversion to the last marketing event someone was exposed to. Studies on synthetic data sets have proven that MTA does a much better job of recovering the true effect of many marketing touchpoints than does last touch. This makes a lot of sense…if someone searches for a brand and then buys it, there were probably ad exposures that led to desire before the search event that deserve credit. The only reason that many marketers still use last touch attribution is because it is much easier to base decisions on last touch. Simplicity, not accuracy, describe the persistence of marketers using last touch attribution methods. Efficient reach (within target) is the most important consideration in media planning. Media planners have a certain play in the playbook that is based on maximizing reach within a naively defined target like Women 18-49 for the best CPMs possible. This is so 1980s! Time to move on! People use statistics to bolster weak but plausible arguments. False marketing prophets lead to bad profits, so challenge everything! Some have asked where my representation of Ehrenberg-Bass definition of loyalty comes from. Here is a link to the presentation by Prof. Rachel Kennedy of EBI and Leslie Wood of NCS. This was presented June 13, 2018 in NY at the ARF AudiencexScience conference. https://thearf.org/category/news-you-can-use/building-brands-heavy-buyers-or-non-buyers-the-debate-goes-on/#more-349285 Readers should download the full presentation (link at the end) and see slide 18. The quote of Disraeli about statistics as lies are at best plausible. Where it can become possibly true is in the area of political research where the commissioned research, in most cases, are designed to validate preconceived notions of politicians rather than ferreting out truths. Winston Churchill assigned a young politician to get statistics for him to prove that there were more positive events during his watch. That is political statistics. perfect analogy to what happens in marketing all the time. Planners are always starting with the hypothesis then finding bits and pieces to support their a priori argument. 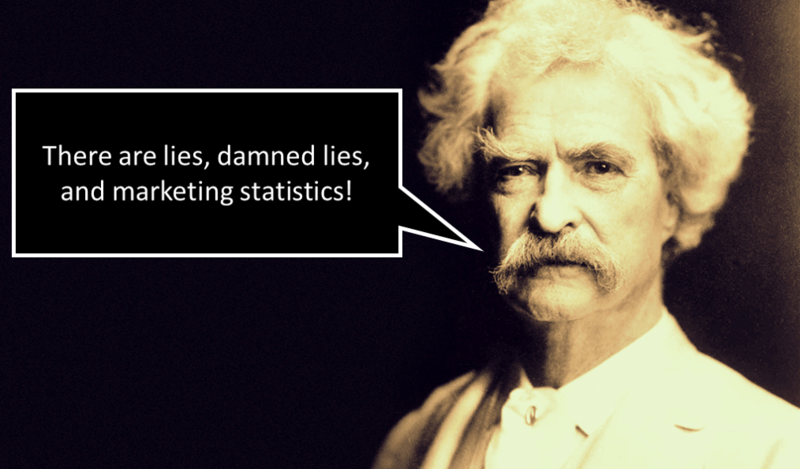 Another common quote is that marketers use marketing research as a drunk uses a lamppost…for support not illumination. All I am trying to do with this blog is bring a dialogue to the marketplace, supported by ample opposing evidence and theory, that some of the ideas that are commonly held might, in fact, be quite wrong.